Robert Coleman Atkins, MD (October 17, 1930 – April 17, 2003) was an American doctor and cardiologist, best known for the Atkins Nutritional Approach (or "Atkins Diet"), a popular but controversial way of dieting that entails eating low-carbohydrate, high-fat and high-protein foods. Atkins graduated from the University of Michigan in 1951 and received a medical degree from Cornell Medical College in 1955, after which he specialized in cardiology and herbal remedies in place of (or before) pharmaceutical drugs, but not limited to acne, cancer, carpal tunnel syndrome, and depression. 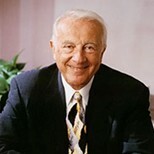 Dr. Atkins founded Atkins Nutritionals Inc. in 1989 . The company emerged from bankruptcy January 10, 2006 with a business strategy that softened the emphasis on the low carbohydrate diet and concentrated on the sales of prepared nutritional bars and shakes. Now ANI is a market-leading portable nutrition foods company offering great-tasting bars and shakes under the Atkins Advantage brand that have a proven nutrition advantage versus the competition --higher protein, fiber, vitamins and minerals, low sugar and no trans fats. Atkins Advantage nutrition bars and shakes appeal to the broad audience of healthy, active men and women who choose foods wisely to enhance their health and well-being, and are available to purchase in more than 30,000 locations throughout North America.